In all the other MWC bombast, you might have missed that Samsung's added another member to its humble Galaxy S WiFi (Galaxy Player) PMP-lineup. This version packs a 4.2-inch WVGA (480 x 800) screen, runs Gingerbread 2.3 and has dual cameras (2-megapixels 'round back and VGA for video calls). Bluetooth 3.0, USB 2.0 and WiFI 802.11 b/g/n round out your connectivity and you'll also find it toting a 1,500mAh battery. Need for Speed: Hot Pursuit is bundled bundled as standard, which is great for some illegal street-racing on the go. It'll come in 8 and 16GB variants, with the usual microSD card slot for that extra 32GB of space when required. No word on pricing or availability, but we'd imagine it won't head too far past the $250 mark. 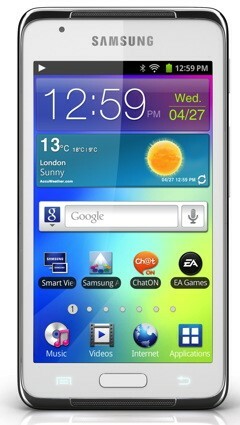 Samsung announces the Galaxy S (Player) WiFi 4.2 at MWC originally appeared on Engadget on Mon, 27 Feb 2012 02:00:00 EDT. Please see our terms for use of feeds.